I love the look of handmade ceramics mixed in with more modern, streamlined pieces, but dislike how much they always seem to cost when I find them at cute boutiques. 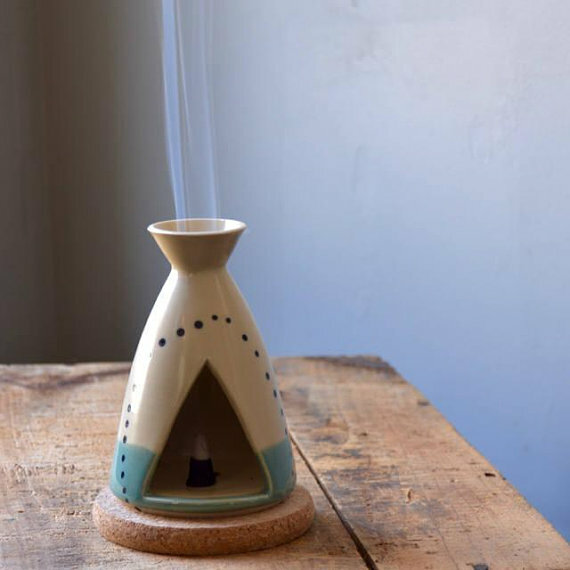 So I braved the wilds of Etsy to find some good specimens, starting with this too-cute updated teepee incense burner. The dot pattern on this bowl almost looks like Marimekko, but is somehow infinitely cooler. This yellow serving bowl bowl is the priciest item here, but it’s such a little statement. 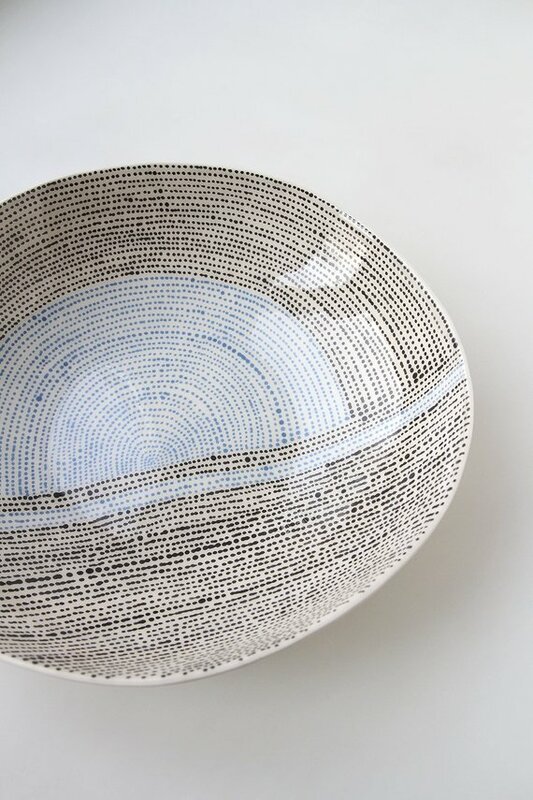 And yet another serving bowl, this one with a delightfully swirly pattern. This vase has an appealingly organic shape. 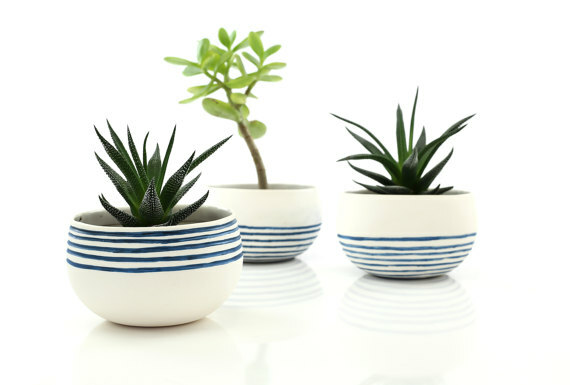 And I dig the preppy feel of these striped planters. I highly recommend Jeremy Ayers pottery–can be found in Vermont and many stores elsewhere. I think Mociun in Brooklyn carries it now. I got a Jeremy Ayers mug from Mociun a few years ago as a Christmas present and love the crap out of it. The Robert Blue stuff she carries (Or used to carry? Dunno what she offers now) is really nice, too. You are SO cool, DeDe! I wish! 😂 I’m just an Adult Child of Hippie Parents who has a ceramics-collecting problem! Love this post! 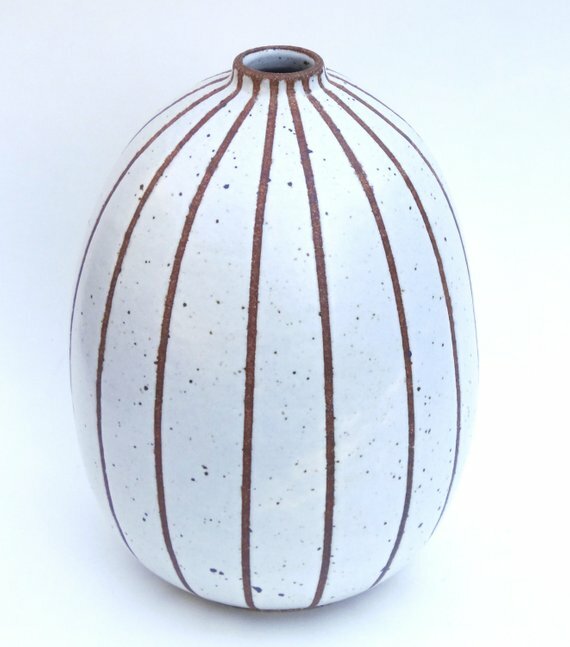 For garden pottery, I purchased from here this year: https://www.wakefieldhandmade.com/ Really pretty handmade items. Everything here is awesome. Love the big bowl with blue sphere... Etsy is amazing. I just wanted to point out that ceramics seem expensive because they’re like any other piece of art. 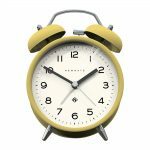 You’re paying for the time and effort that went into creating the piece; throwing it takes minutes but trimming, carving, firing, painting, glazing, firing again… even not counting firing time, you’re looking at many many hours. The yellow bowl above seems a bit pricey, so the potter must be pretty well-known/successful. 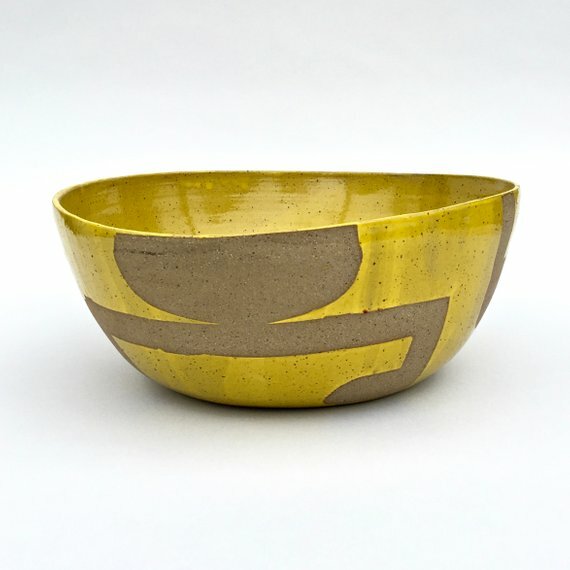 I’m frankly astounded at the prices of the dotted bowl/similar pieces on that potter’s site. Unless they know some trick I’m not aware of, those dots were placed one. at. a. time. Placing the pattern alone must have taken hours! I just wanted to point out that ceramics seem expensive because they're like any other piece of art. You're paying for the time and effort that went into creating the piece; throwing it takes minutes but trimming, carving, firing, painting, glazing, firing again... even not counting firing time, you're looking at many many hours. The yellow bowl above seems a bit pricey, so the potter must be pretty well-known/successful. I'm frankly astounded at the prices of the dotted bowl/similar pieces on that potter's site. Unless they know some trick I'm not aware of, those dots were placed one. at. a. time. Placing the pattern alone must have taken hours! All that said, I love the wax resist and the yellow glaze. I might start calling all my wonky bowls “asymmetric” and see if that makes people like them more. Ha! I am tickled/irked at the idea of calling an unevenly thrown bowl "asymmetrical" and charging a bajillion dollars for it. Also "reclaimed clay" like it's reclaimed wood. LOL. So many LOLS! (For non-potters, reclaimed clay is just clay you used for something and then changed your mind before it got fired. It's not really that different from clay you got straight out of the bag. It's like they're bragging "we didn't throw out perfectly usable material!") All that said, I love the wax resist and the yellow glaze. 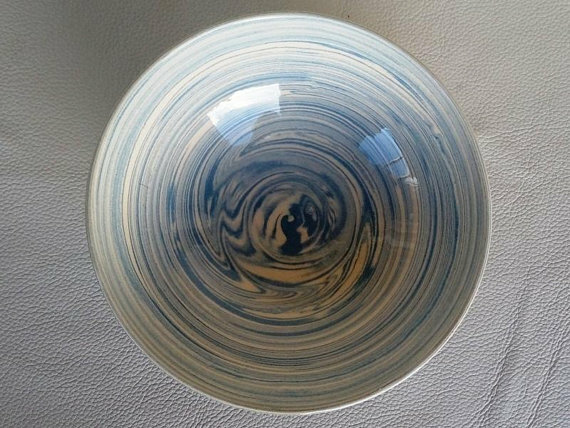 I might start calling all my wonky bowls "asymmetric" and see if that makes people like them more. Ha! 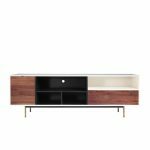 Girls, if you want some fun eye candy (with gorgeous pottery), go to Youtube and watch Michael Kors give a tour of his penthouse. He’s so 100% himself, it just makes me swoon. Girls, if you want some fun eye candy (with gorgeous pottery), go to Youtube and watch Michael Kors give a tour of his penthouse. He's so 100% himself, it just makes me swoon. Some of those bowls are gorgeous! I’ve been crazy for ceramics ever since taking a family trip to northern Wisconsin as a teen and finding a tiny artisan shop where I purchased a mug and a wind chime. 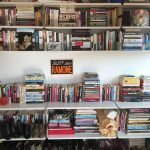 (Important purchases as a 15-yr old who does not own a house!) Some of those bowls are gorgeous!